Telgemeier, Raina. Smile. 213 p. Graphix 2010. ISBN 978-0-545-13205-3.Smile is pure genius. For anyone who has had braces, you’ll be able to relate to this true story, told in graphic novel form, of what the author, Raina Telgemeier, went through during middle and high school. 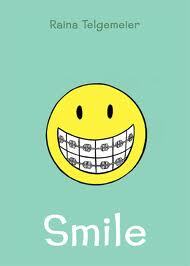 If you didn’t have, or haven’t yet had, braces, you will still love it! It’s painfully funny and you will most likely recognize one or more of the characters. When she was in 6th grade in San Francisco, she fell and knocked out her two front teeth after a Girl Scout meeting. What ensued all the way through high school were many orthodontic surgeries and many different embarrassing and odd-looking orthodontic contraptions. Add puberty to the equation, mean girls, and the story is painfully and poignantly entertaining. Lo and behold, she somehow survived it all. An inspiring sidebar is that Raina began her love of creating cartoons during this time period. So, good can come out of bad! This book will appeal to a vast audience-from avid readers to reluctant readers, and from kids who have had orthodontic work to kids who have never even been inside of an orthodontics’s office. This entry was posted in booktalks, comic, Nonfiction and tagged beauty, braces, comic, coming-of-age, humor, middle school. Bookmark the permalink.